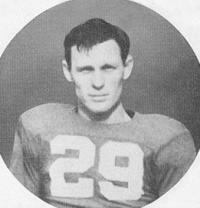 Our Spotlight On Jack Lummus - A Real Football Hero. In 1941, Jack Lummus traveled to the New York Giants' training camp in Superior, Wisconsin. As one of the 30 players who made the Giants' roster, he wore No. 29. He had signed on as a free agent and received a $100 monthly salary. He made the team as a rookie end and played in nine games. On December 7, 1941, the Giants were playing their archrival the Brooklyn Dodgers. Around half-time, the Associated Press ticker in the press box gave out a message saying, "Airplanes identified as Japanese have attacked the American Naval Base at Pearl Harbor." The players continued the game, knowing nothing of the attack. The Giants lost but went on to play the Chicago Bears in the NFL championship game. After the championship game, Lummus enlisted in the Marine Corps Reserve on January 30, 1942. After finishing basic training at the Mainside recruit training center in San Diego, California, he was assigned to Camp Elliott, 10 miles north of San Diego. There he joined the Devildogs, the San Diego Marine Corps baseball club. In May 1942, he was sent to the busy seaport of Mare Island as a military policeman. There he joined another baseball club. On June 10, he was promoted to private first class, and two months later he was promoted to corporal. On October 18, he enrolled at the Officers Training School at Quantico, Virginia. He graduated on December 18, and received a commission as a second lieutenant. He was sent back to California and was assigned to the elite Marine Raiders at Camp Pendleton. When the Marine Raiders were dissolved, he was assigned to the 27th Marines, 5th Marine Division. In January 1944, he was assigned as executive officer, Company F, Second Battalion. In August 1944, the division was transferred to Camp Tarawa outside of Waimea, Hawaii. Lummus boarded the USS Henry Clay for the trip. After four months of training, the Division was assigned to the Fifth Amphibious Corps and would fight to take the island of Iwo Jima. Lummus was in the first wave of troops to land at Iwo Jima on D-Day, February 19, 1945. He landed at 9 a.m. on the beach known as Red One. He and his platoon spent the next two weeks incessantly fighting the dug-in Japanese. His initial duty was a liaison officer for the Second Battalion, spotting targets on the slopes of Mt. Suribachi for artillery and air strikes. On March 6, he was given command of Company E's third rifle platoon. On March 8, his platoon was spearheading a final assault on an objective east of Kitano Point, near the northern edge of the island. Despite minor wounds received from grenade shrapnel, Lummus knocked out three enemy strongholds, well-fortified positions arranged to defend each other, which were preventing his platoon from reaching its objective. Following this action, he stepped on a land mine and was mortally wounded, losing his legs. While lying on the ground, he urged his platoon on, until he was carried off to an aid station. At the aid station, he famously told the doctor, Thomas M. Brown, "Well, doc, the New York Giants lost a mighty good end today." He was transferred to the field hospital, where he underwent surgery and a transfusion of 18 pints of blood, but died of internal wounds on the operating table. He was buried in plot five, row 13, grave 1,244 in the Fifth Division Cemetery. His body was later moved to Ennis, Texas. We are not affiliated with the NFL or the NFL's official site.